SoftEther VPN is not a hardware VPN product. You can download it and install it today on your computer. If you want to try SoftEther VPN, you need not to purchase new server PCs. Instead, you can use the unused PCs which are left on your office or home. Any type of computers which supports the operating system supported by SoftEther VPN can run SoftEther VPN. No risks or costs to try it you have to pay. After you decided to install SoftEther VPN for earnest purpose, you may purchase the new server computers. But if you want to save a cost, you can share a single server computer for several purposes. On the operating system you can run a few server programs simultaneously. 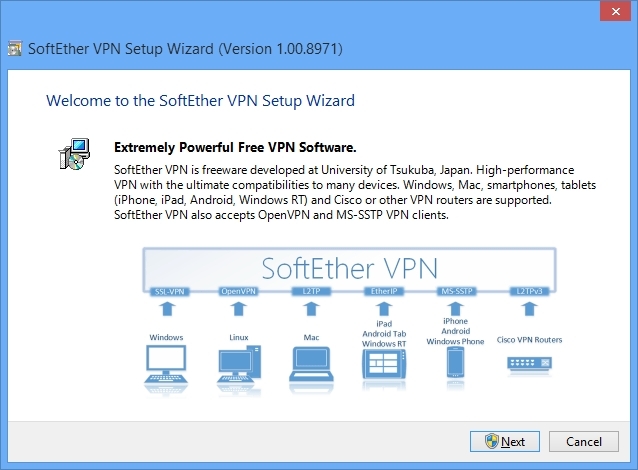 Because SoftEther VPN software is as software, if a newer version will be released, you can easily update to it. No trouble with rewriting the firmware programs such as hardware VPNs. You simply run the installer on the server from remotely and it is adequate. SoftEther VPN is just a program. It works as a background service. 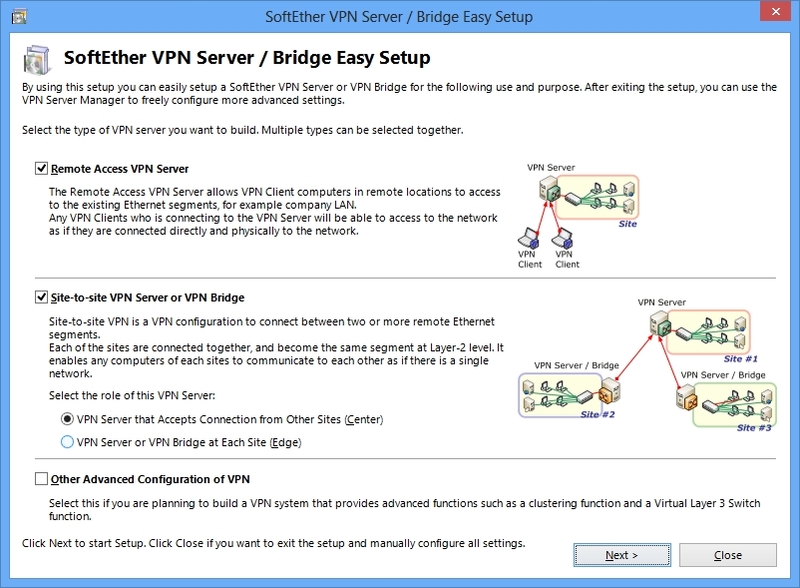 As mentioned above, SoftEther VPN simple virtualizes devices of Ethernet. Thus, to understand SoftEther VPN and to design a network topology with SoftEther VPN is very easy for everyone who has a basic knowledge about Ethernet. This is a big advantage of SoftEther VPN which other legacy and troublesome VPNs don't have. Due to these simple characters of SoftEther VPN, it is also easy to do a troubleshooting if some problems have occurred. You don't need any salary-devouring-experts of IPsec or Cisco any longer. SoftEther is easy-to-use, and easy-to-design. VPN beginners can start enjoying VPN today. The Installation and initial configuration can be done by you alone without reading bothering manuals. Almost all settings can be configured by clicking-mouse in the graphical configuration utility for Windows. Please compare this advantage to any other VPNs which requires command-line interfaces or failure web interfaces. SoftEther VPN Setup Wizard. 100 or more times easier than Cisco VPN Routers. Installation process is less than a minite. Try this today. SoftEther VPN Server can be managed from remote computer via TCP/IP network. For example, you install SoftEther VPN Server on the Linux server computer and that computer is on the machine room of company. And you have a laptop PC with Windows. 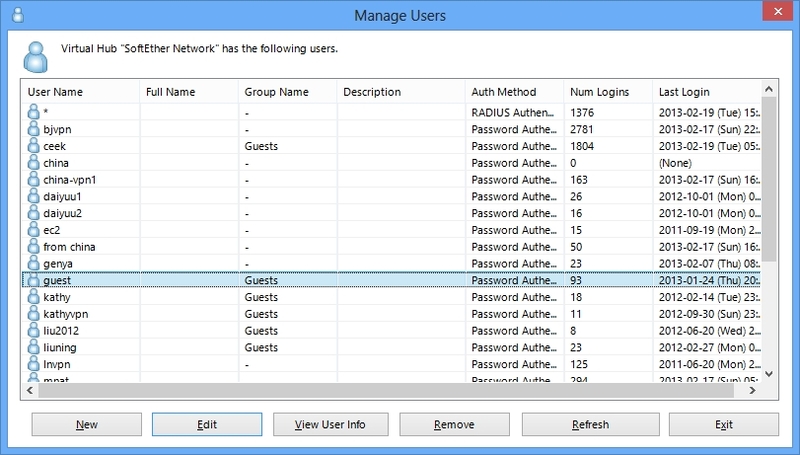 Then you can install GUI Management Tools on the Windows laptop and connect to the VPN Server remotely from that tool. All communications for management purpose occupies the same port for accepting new VPN Session on the server, so nothing will bother you to ensure the connectivity of management RPC connection. Of course all RPC (Remote Procedure Call) packets via the management connection are encrypted as same as VPN packets with SSL encrypted channel. VPN Server Manager can connect to remote VPN Server program. You can manage VPN Server on Linux, FreeBSD, Solaris or Mac, from Windows laptop. 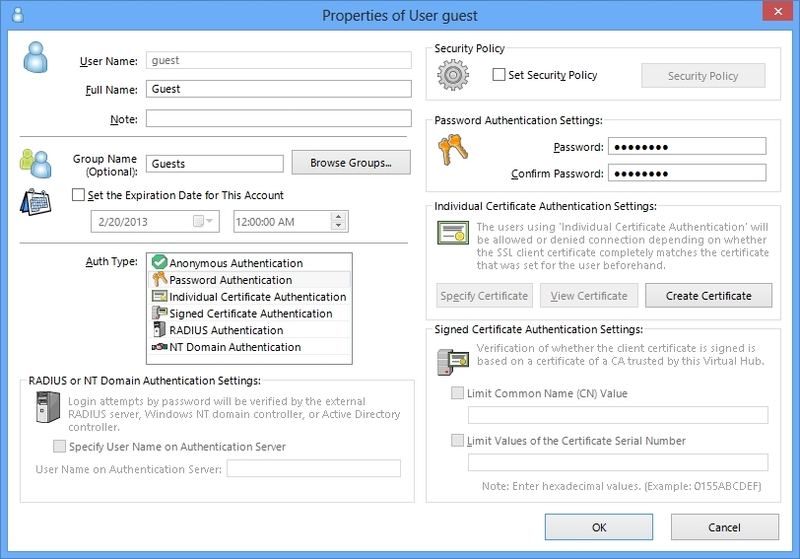 The standard and comfortable way to set up and manage SoftEther VPN Server is to use the GUI Management Tool for Windows. This tool can be used to manage all SoftEther VPN Server on anywhere and on any Operating Systems. 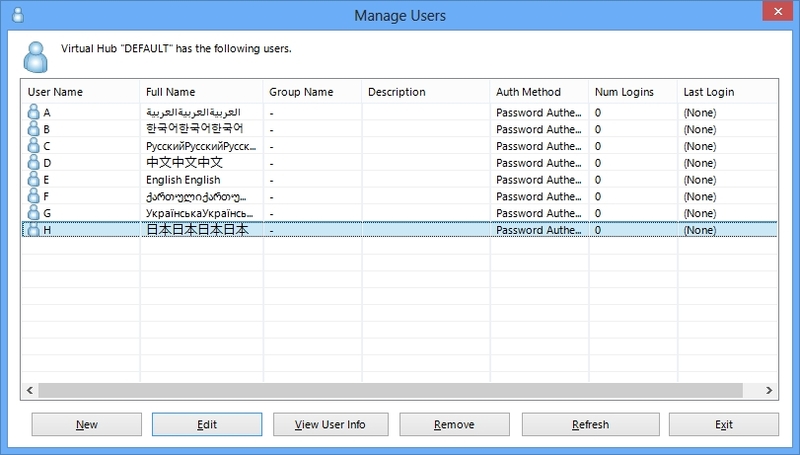 This GUI Management Tool implements almost all of varieties of configurable values on the VPN Server. So you don't need to use troublesome command-line interfaces nor web-based sometimes-crashes interfaces at all. It is contrastive to any other legacy VPN products. VPN Server Manager Main Screen. Control everything from here. User Manager. Add, delete or modify user database per a Virtual Hub. You can view a list of current VPN sessions on the VPN Server. Obtain more detailed information about a session, or disconnect a session here. 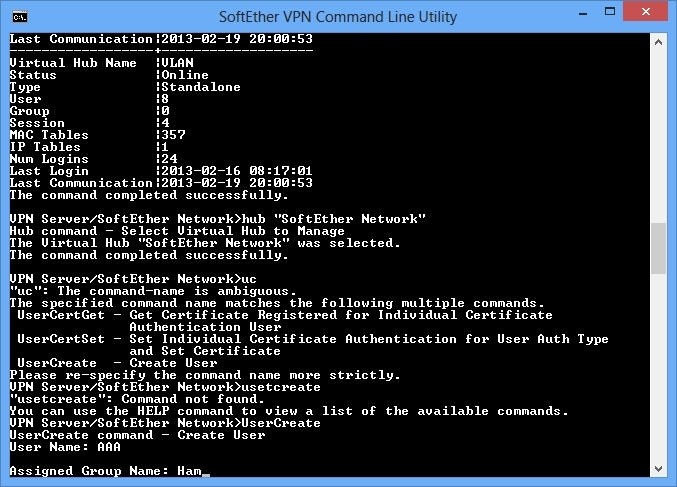 Of course SoftEther VPN has command-line management tool, which is called "vpncmd" program. 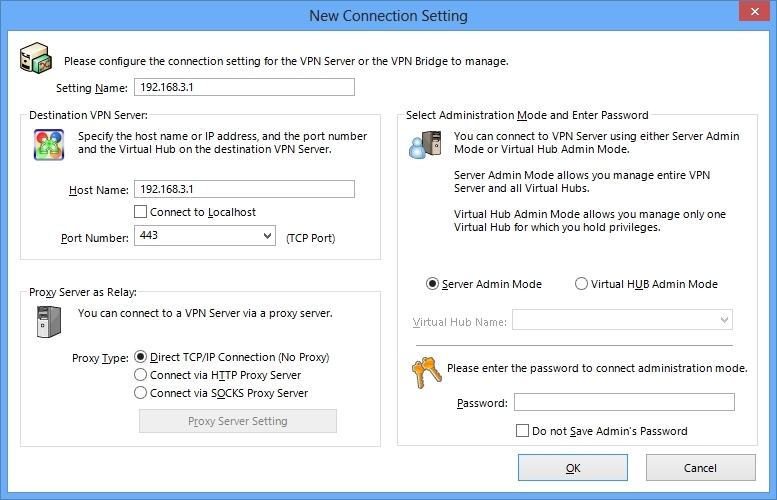 The vpncmd program can be used to manage SoftEther VPN Server in the situation you cannot use GUI tools. For example, you want to create several thousands of VPN user objects on the Virtual Hub, you can write a script or batch file for kicking the vpncmd in order to create all users and simply start the script. It will reduce you mouse-clicking count. Other purpose for using vpncmd is for automatically operation in regular time period. For example, if you want to activate a Virtual Hub on the VPN Server at every same time of every day and deactivate it as same as so, you can use Operating System's task scheduler in order to kick-start the vpncmd with appropriate command-line parameters. "vpncmd" is a Command-line Utility to manage VPN Server, Client and Bridge. vpncmd works on Windows, Linux, FreeBSD, Solaris and Mac OS X. It can be invoked from batch files or shell scripts. Traditional VPN Server software need to be installed, and need to be run by administrator privileges. If you don't have the administrator's password of your company's PC, you cannot install VPN Server software on the computer. It was very inconvenient. To solve this problem, SoftEther VPN Server has the "User-mode Install" function. 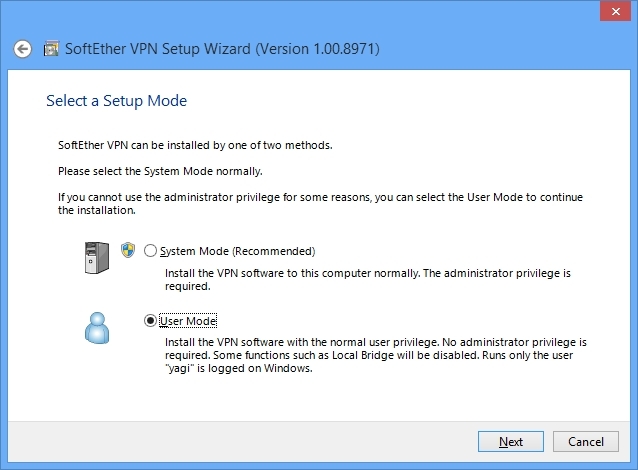 You can install the VPN Server on your computer by yourself, no need to ask your system administrator to install it. It will reduce the cost of system administration, and help individual users' literacy in the company to learn to install and manage one's own VPN Server on their each PC. Installing and running on the normal user's privileges is also good for security. Most of all VPN products (Cisco's, Juniper's, Microsoft's and Check Point's) running in the kernel-space or system-space of the operating system. If a vulnerability will be found on the VPN system, the entire system will be affected by the vulnerability. It was very dangerous. Therefore user-mode installation is not only convenient, but also secure. User-mode installation is very easy. It is supported on the setup wizard. You can simple choose the "User-mode" radio box in the wizard. In the UNIX, instead of the wizard, the Makefile can be used to build and run the VPN Server in the user-mode. It helps you to install VPN Server even if you don't have Administrator's password. 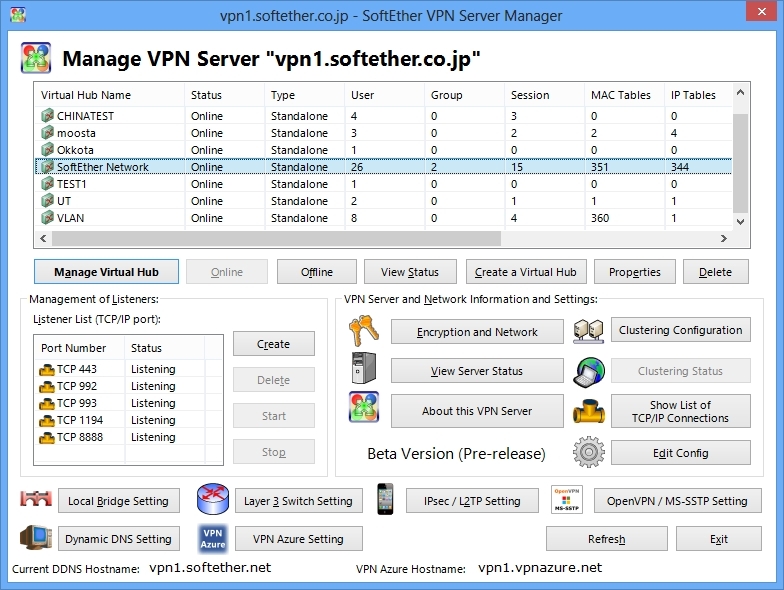 SoftEther VPN is fully Multilanguage supporting software. The single binary of PacektiX VPN contains currently three languages: English, Japanese and Simplified Chinese. Once you install software on the computer, you can switch the language to display the UI texts at any time. Even no computer reboots are required to switch the language. SoftEther VPN has a support for Unicode strings. You can use any local characters on the software (except some fields which require ASCII strings). If your company has multi-national employees, you can register user objects with all person's full name on the single VPN Server. You can mixture any languages.